Lt. Gov. Mary Taylor met with local small business owners at the Orange Branch of the Delaware County District Library Tuesday about their concerns with today’s job market. Local small business leaders had a chance to express their concerns about the job market to gubernatorial candidate Lt. Gov. Mary Taylor. 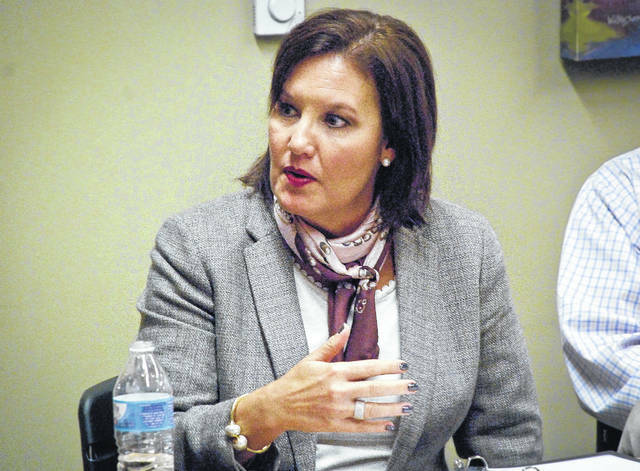 Taylor, one of four Republicans running for governor in 2018, held a roundtable Tuesday at the Orange Branch of the Delaware County District Library to hear input from business leaders and roll out the third initiative in her platform. Taylor believes through a common sense approach there is a way to strike a balance between regulation and job creation. “I will create a jobs cabinet whose mission will be to establish a jobs friendly attitude in every corner of state government,” she said. Taylor said the jobs cabinet would include members from the Ohio EPA, Bureau of Workers Compensation, Department of Taxation, Department of Commerce, and Department of Transportation. She said the cabinet would report directly to CSI, which reports directly to the governor. Taylor said the agencies would work together to “come up with solutions that make sense across all state agencies.” She said one of the keys to her plan is to define “job friendly” and hold agencies accountable to what that means. She wants to work with the legislature to find “statutes that don’t make sense” and get rid of them. Judd Scott, president and COO of Hydraulic Products, said Delaware County is a little different when it comes to job creation. Delaware isn’t alone, Taylor said. “We hear this everywhere,” she said, noting that the same issue was presented to her Tuesday morning in Wooster. “There is no doubt that we do have an issue in the State of Ohio with having an adequately trained workforce to take the jobs that actually exist,” she said. Taylor said she has plans to roll out another policy proposal focused on workforce training and education. Taylor said Ohio is losing the “best and brightest” to out-of-state colleges. She said the state needs to grow the population and it needs to find ways to keep people here. Bruce Daniels, owner of Marysville Honda, said he established a driving school as an outreach to 13 to 16 year old children. Daniels said in his company there are six auto technicians that are making $75,000 per year. This entry was tagged delaware, jobs, Mary Taylor. Bookmark the permalink.